Easily assembled, layered with delicious titbits of one’s choice and pleasing to the palate as well as the eye, sandwiches are a hearty meal option at any time of the day. The BIG and BAD Powerplay Club Sandwich brims with simplicity but you can never get enough of it. 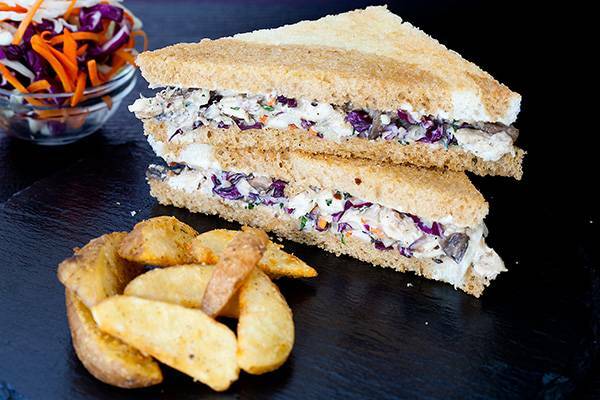 Cajun-spiced chicken, roasted and pulled while still warm, is tossed with a creamy carrot and cabbage slaw, layered between slices of our marble bread and served with the essential golden-fried potato wedges. 1. Marinate chicken breast with salt, pepper, blackened Cajun, oil and keep it aside. Sear on a hot plate and cook in the oven, till done. 2. Now pull the chicken into thin shreds and mix the pulled chicken with mayonnaise. Add a little more Cajun spice if required. Check seasoning. 3. Wash and julienne capsicum, cabbage, and carrot. Marinate the cut veggies with salt and pepper. Squeeze off the excess water and add mayonnaise into the mix to make coleslaw. Check seasoning. 4. Toast jumbo bread slices, spread mayonnaise evenly on all slices. Spread coleslaw on the base slice, and finally cover it another slice. 5. Spread chicken mixture evenly on the other slice and cover the sandwich. 6. Cut the bread sides into two diagonal pieces and serve with potato wedges(optional).